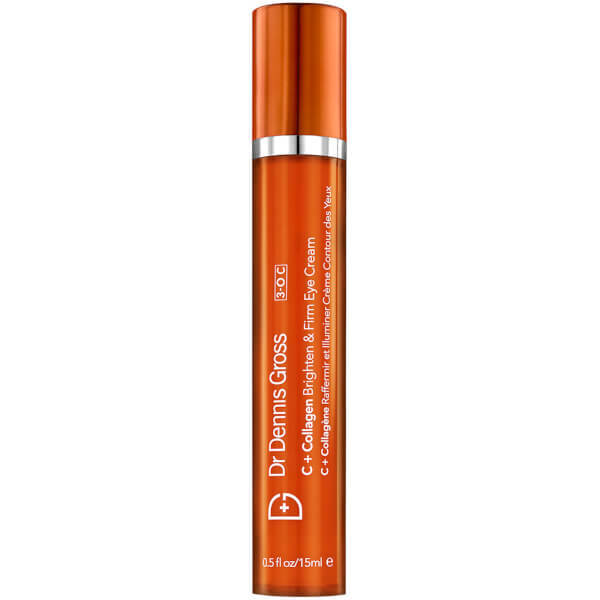 Revive the look of tired, ageing eyes with Dr Dennis Gross Skincare C+Collagen Brighten and Firm Eye Cream, an energising eye treatment that addresses signs of ageing and fatigue around the delicate eye contour. Combining a proprietary Vitamin C Complex with Collagen Amino Acids and a unique Energy Complex, the silk, anti-ageing cream melts effortlessly into skin, delivering smoothing and brightening properties to promote radiant and youthful-looking results. Tackling the appearance of fine lines and wrinkles, it contains Ceramides to strengthen and firm the look of skin, whilst peptides encourage collagen production for smoother, visibly younger-looking eyes. 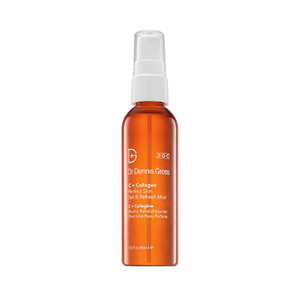 It also utilises light reflectors to blur imperfections and brighten dark circles. 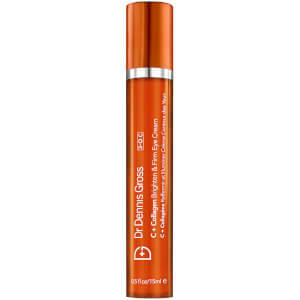 After use, eyes appear radiant, revived and energised. Water/Aqua/Eau, C12-15 Alkyl Benzoate, Glycerin, Pentylene Glycol, Caprylic/Capric Triglyceride, Niacinamide, Aminobutyric Acid, Glyceryl Stearate, PEG-40 Stearate, Silica, Stearyl Alcohol, 3-O-Ethyl Ascorbic Acid, Ascorbic Acid, Collagen Amino Acids, Superoxide Dismutase, Glycine, Hydroxyproline, Carnitine, Ubiquinone, Adenosine, Phyllanthus Emblica Fruit Extract, Hydrolyzed Soy Protein, Ascorbyl Glucoside, Ceramide NG, Ceramide 2, Dipeptide-2, Palmitoyl Tetrapeptide-7, Palmitoyl Tripeptide-1, Palmitoyl Hexapeptide-12, Hesperidin Methyl Chalcone, Ectoin, Chrysin, Glycyrrhiza Glabra (Licorice) Root Extract, Cucumis Sativus (Cucumber) Fruit Extract, Tocopherol, Lactic Acid, Biotin, Sea Whip Extract, Porphyridium Cruentum Extract, Echinacea Angustifolia Extract, Arnica Montana Flower Extract, Phytic Acid, Tetrasodium EDTA, Trisodium EDTA, Citric Acid, Sodium Citrate, N-Hydroxysuccinimide, Lecithin, Tribehenin, Sorbitan Isostearate, Steareth-20, Ceteareth-20, Hydroxypropyl Methylcellulose, Pullulan, Acrylates/C10-30 Alkyl Acrylate Crosspolymer, Hydroxyethyl Acrylate/Sodium Acryloyldimethyl Taurate Copolymer, Cetearyl Alcohol, Polysorbate 60, PEG-10 Phytosterol, Leuconostoc/Radish Root Ferment Filtrate, Phenoxyethanol, Chlorhexidine Digluconate, Potassium Sorbate, Benzyl Alcohol, Sodium Benzoate, Mica, Titanium Dioxide (CI 77891).